In England Edward IV proclaimed that every Englishman and Irishman living in England must have of his own a bow of his own height ‘to be made of yew, wych, or hazel, ash or auborne or any other reasonable tree, according to their power’. The same law provided that buttes or mounds of earth for use as marks must be erected in every town and village, and listed a series of penalties for those who did not practise with the longbow. Richard III was one of the kings who recognised the value of the archer; Shakespeare makes him say, just prior to the Battle of Bosworth: ‘Draw archers, draw your arrows to the head!’ There are also records telling that Richard sent a body of 1,000 archers to France to aid the Duke of Brittany. Henry VII also provided anti-crossbow legislation and sent large levies of English archers to fight for the Duke of Brittany. During this entire period English longbowmen served in many parts of the then-known world. The introduction of gunpowder was the beginning of the end for the archer; although over 400 years were to pass before the bow and arrow were finally overcome by gun-fire, the seeds were sown in the fourteenth century at Crécy and Sluys. The making of a skilful archer was a matter of years, but an adequate gunner could be produced in a few months – it was far too easy to attain a certain amount of proficiency with the new weapons for the bow to remain highly popular. At first the longbow was vastly superior to the newly invented handguns and arquebuses, which did not attain any great degree of efficiency before the end of the fifteenth century. When they did, the bow – the weapon par excellence of England – fell into disuse, although the archer could discharge twelve or fifteen arrows while the musketeer was going through the lengthy operation of loading his piece. The longbow could be aimed more accurately and its effective range of 200 – 240 yards was greater; the hitting-power of a war-arrow, weighing about two ounces, was far greater than that of a musket-ball, weighing from one-third to half an ounce. Archers could be lined up as many as ten deep and shoot together over each other’s heads to put down an almost impassable barrage; and it was a terrifying barrage that could be seen descending. It is not outside the bounds of possibility to claim that the musket used at Waterloo in 1815 was inferior to the longbow used at Agin-court in 1415, both in range and accuracy. Early firearms were reasonably good weapons of defence when they could be rested upon ramparts and their powder kept dry, otherwise they were far less deadly than the longbow in competent hands. In 1590 Sir John Smyth, a formidable military writer of the time, in his work The Discourse presented a wholesale condemnation of the new weapons, the mosquet, the caliver and the harquebus. The book was hastily suppressed by English military authorities; the stern, lone voice, crying for a return to the older and more effective ways of the longbow did not coincide with current military thinking. One also had to consider that the merit of early firearms lay in the prestige which they brought to the princes who armed their men with them. In many of the battles of the Wars of the Roses, artillery was combined with archers, so that the enemy was put in a position where he had either to fall back or to charge in order to escape missile fire – just as similar tactics had won the field of Hastings for William in 1066. Edgecott Field was notable as a renewed attempt of spearmen to stand against a mixed force of archers and cavalry. Here the Yorkists were entirely destitute of light troops, their bowmen having been drawn off by their commander, Lord Stafford, in a fit of pique. This meant that Pembroke and his North Welsh troops were left unsupported. The natural result followed; in spite of the strong position of the King’s son, the rebels, by force of archery fire, quickly caused them to descend from the hill into the valley, where they were ridden down by the Northern horse as they retreated in disorder. Notwithstanding the undoubted strength of this array, the archer still appeared to achieve sufficient penetration with his shafts to be considered a worthwhile part of the forces. At Towton, on Palm Sunday, March 29th, 1461, Lord Falconbridge, commanding part of the army of Edward IV, used his archers in an interesting tactical expedient which sufficed to decide the day when both armies were employing the same weapon. The snow, which was falling very heavily, was being blown by a strong wind from behind the Yorkists and into the faces of the Lancastrians; it rendered the opposing lines only partially visible to each other. Falconbridge ordered his archers to the front, to act more or less as skirmishers. It must be explained that two types of arrows were then in use – the flight arrow and the sheaf arrow; the former was lightly feathered, with a small head; the latter was high-feathered and shortly shafted with a large head. Flight arrows were shot at a great distance and, at proper elevation, could kill at 240 yards. Sheaf arrows were for closer fighting, requiring but a slight elevation, and were often shot at point-blank range. The advancing archers had been carefully instructed to let fly a shower of sheaf arrows, with a greater elevation than usual, and then to fall back some paces and stand. Aided by the gale, the Yorkist arrows fell among the Lancastrian archers, who, perceiving that they were sheaf arrows and being misled by the blinding snow as to their opponents’ exact distance from them, assumed that the enemy were within easy range. They commenced firing volley after volley into the snowstorm, all of which fell sixty yards short of the Yorkists until the snow bristled with the uselessly expended shafts like porcupine quills. When the Lancastrians had emptied their belts, the Yorkists moved forward and began firing in return, using not only their own shafts but also those so conveniently sticking out of the snow at their feet. 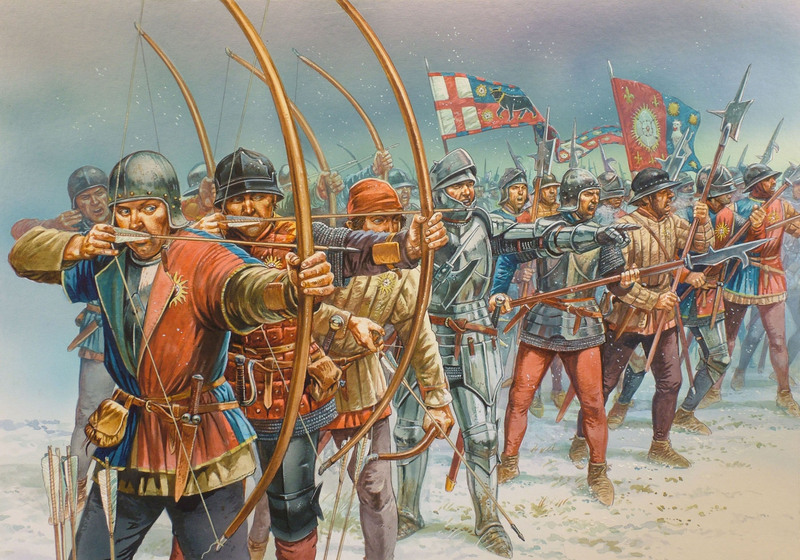 Their shooting had great effect and men fell on all sides as the wind-assisted shafts came hissing into them; in a short time it was possible for the billmen and men-at-arms of Warwick and King Edward to advance comfortably forward without receiving any harassing fire from the Lancastrian archers. Needless to say, the Yorkist archers then laid aside their bows and went in with the more heavily armed infantry. It was a strategem that won the battle, and was one that could only be used when the adversaries were perfectly conversant with each other’s armaments and methods of war. Even in the late fifteenth and early sixteenth centuries the longbow still retained its supremacy over the arquebus and had yet some famous fields to win, notably that of Flodden in 1513, where, as will be seen from the next chapter, the old manoeuvres of Falkirk were repeated by both parties, the pikemen of the lowlands once again being shot to pieces by the archers of Cheshire and Lancashire. As late as the reign of Edward VI we find Kett’s Insurgents beating, by the rapidity of their archery fire, a corps of German hackbuteers whom the government had sent against them. Nor was the bow entirely extinct as a national weapon even in the days of Queen Elizabeth. It was in the reign of the Virgin Queen that the first really great archery writer appeared on the English scene. Roger Ascham, tutor to Elizabeth when she was a princess, was the author of the book Toxophilus, which remains the classic in the field. Allowing for certain minor differences, the phraseology and certain advances which have been made in equipment, Ascham’s book is as valuable to the archer today as it was when it was written four centuries ago. His ‘instructions’ can be, and are, used today in teaching novice archers. Ascham’s relation to the bow corresponds to that of Izaak Walton to the rod and reel. This entry was posted in British, Medieval, Weapons by MSW. Bookmark the permalink.